"Some of the best wines in Ambonnay," says super well regarded Champagne critic Peter Liem. I like her wines a lot, and have not yet tried her best wines yet, but do not agree with Liem, based on what I've drank so far. I am certainly open mined and may change my mind! This is certainly one very cool Grower Producer! Marie-Noelle refers to herself as a "viticulturice" and inherited her vines from her parents in 1984, although the estate has been in existence since 1946. She has vineyards in both Ambonnay (5 hectares) and Bouzy (1 hectare), both Pinot Noir territory. Very small, with effectively 3 hectares as she sells 1/2 her grapes to big Champagne Houses, such as Deutz and Pol Roger, and the winery is actually in an old family stone house in Ambonnay. The wines are very much hand made. She disgorges every bottle she makes by hand with help from a neighbor (watch her in the video below), she hand riddles her wines, and drives her tractor herself. The vines are tended to as naturally as possible with no herbicides or pesticides, and the vines are unfiltered and unsulphered. Fermentation is in stainless steel or enameled steel tanks as they are neutral and add no flavor as for example oak casks would. The wines are not surprising Pinot Noir heavy, 85% and up, the rest Chardonnay. The vines average 40 years old. Wines include: NV Grand Cru Extra Brut (zero dosage meaning no added sugar) and NV Grand Cru Brut with tasting notes below, both aged approximately 3 years on their lees, 85% Pinot Noir and 15% Chardonnay. Vintage Grand Cru Brut, which spends about 5 years on its lees, and Vintage Grand Cru Brut Nature which is the same as the Vintage Grand Cru Brut except that it spends longer on its lees, also 85% Pinot Noir and 15% Chardonnay. Cuvée du Goulté, a Vintage Blanc de Noirs is her top wine, big and 100% Pinot Noir. On the Rose front she makes a NV Brut Rose Grand Cru (tasting notes will be here once I get my paws on the bottle!) and a Vintage Rosé de Saignée Grand Cru. She also makes a small amount of Coteaux Champenoise Rouge, a still Pinot Noir. The Extra Brut and Brut below were drank side by side. I believe they are very young based on their taste and the extreme amount of bubbles on pouring - a serious head. They are both an identically light yellow in color. A medium amber orange color with some pink. The nose has freshly cut green apple, minerals, and a touch of reduction - which interestingly blows off after maybe 90 minutes, not that I considered it a flaw although some might find it off putting. Orange and roses, some red berry taste, apple on the after taste, minerals and a lot of chalk. An easy going yet wonderful aftertaste. 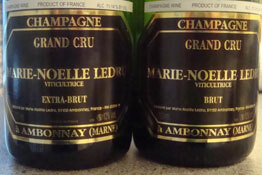 Tasting Note: Marie-Noelle Ledru Extra Brut - rated B?, the question mark as it may improve greatly with time. Nose: Some orange citrus, a touch of passion fruit, chalk as it warms. Palate: Extremely dry, citrus, especially lime. With air it becomes less lime and more mixed citrus with a definite touch of orange citrus and minerals. 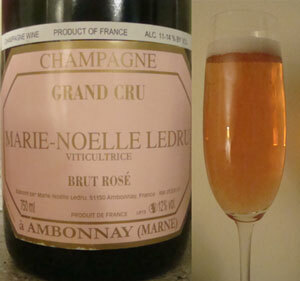 Tasting Note: Marie-Noelle Ledru Brut rated B+?, the question mark as it may improve greatly with time. Nose: Reticent at first, then apple and fresh apple peel. My 8 year old says it smells like apple juice! Some chalk/minerals as it warms and breathes. Palate: Rounder and smoother. Similar to the Extra Brut but more closed.